I have been invited to visit an inclusive school in Accra this winter, called Multikids Inclusive Academy I’m really excited about the prospect. The school is run by Amanda Budge, a teacher and a musician I knew many years ago. 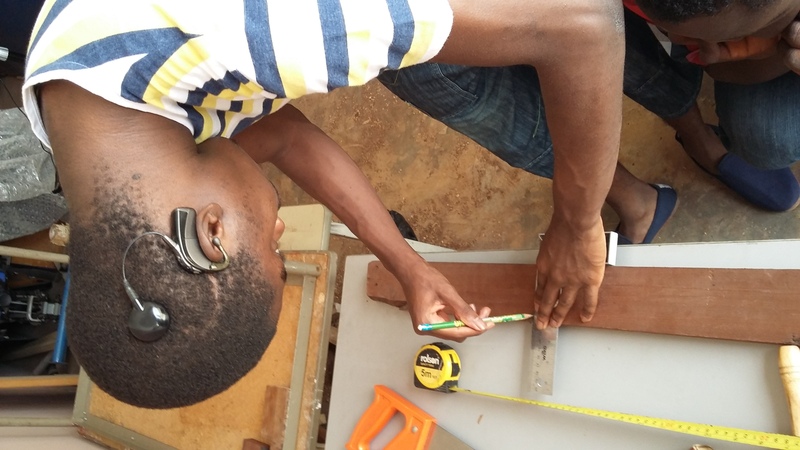 As soon as I get there I will check out where to find materials to make instruments from and get to know the children and staff; so I can find out how my skills can best be put to use. 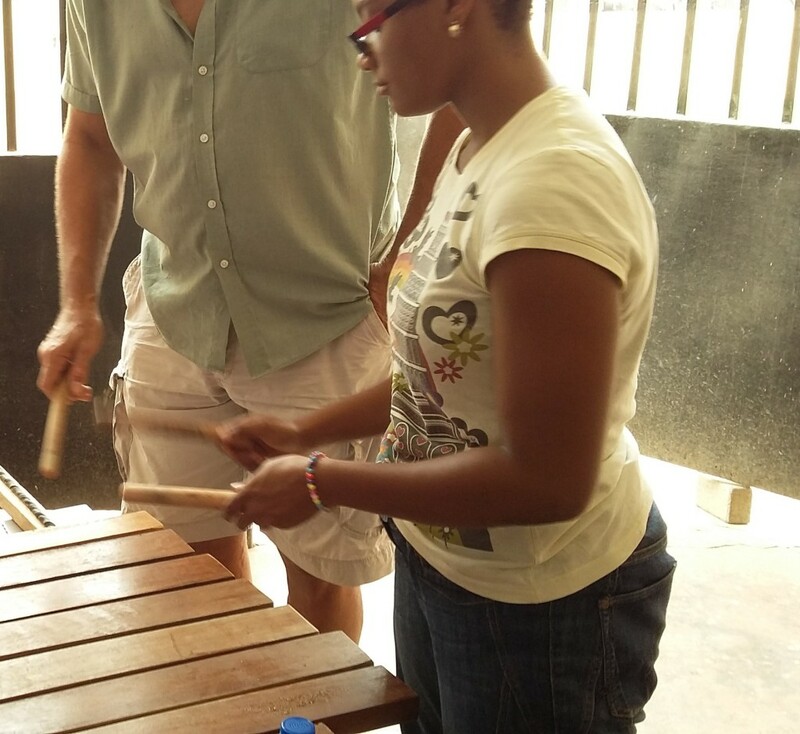 One week since I arrived in Accra and my instrument making mission is moving forward at the Multikids Inclusive Academy. This school is inclusive and there are some students studying for A levels and others with complex problems who will always struggle to read, write and communicate easily. I spent the first few days observing the many different classes and getting to know the children and teachers. We made straw oboes with a few of the KS1 classes, many of the kids managed to play them straight away. I was taken on a shopping trip yesterday to buy essential tools and basic materials for making instruments for the school. We went to the central market area where you can buy anything and everything and the streets are jam packed with walking vendors carrying all sorts on their heads and “pavement shops” too. I nearly got tipped into the open sewers by a car passing too close once! 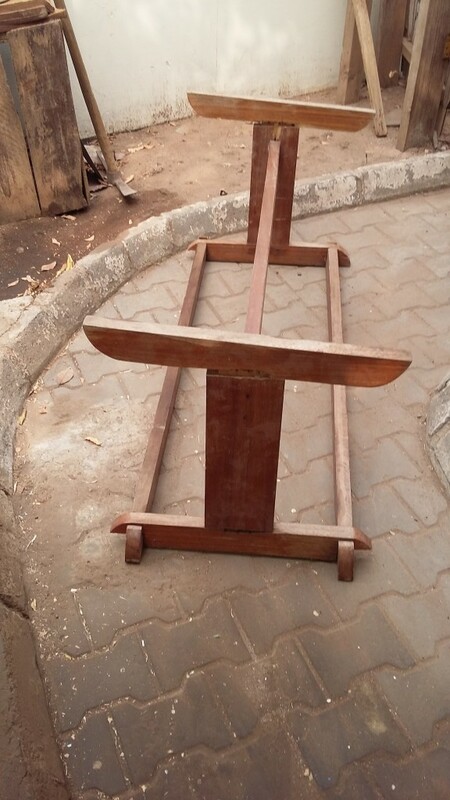 We found a massive old damaged hardwood beam, that will be made into a big xylophone by some of the secondary students, and took it to a woodworking machine workshop where they will turn it into planks for the keys. 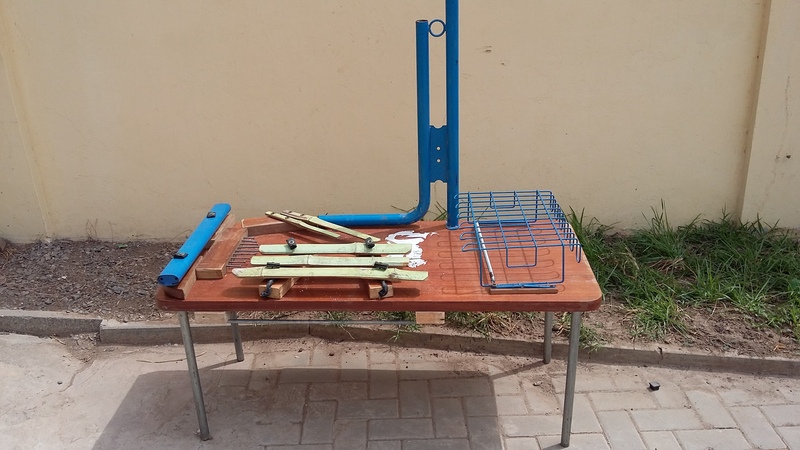 In the meantime I have been dismantling and old broken table, that the school was intending to chuck out, to make another xylophone. 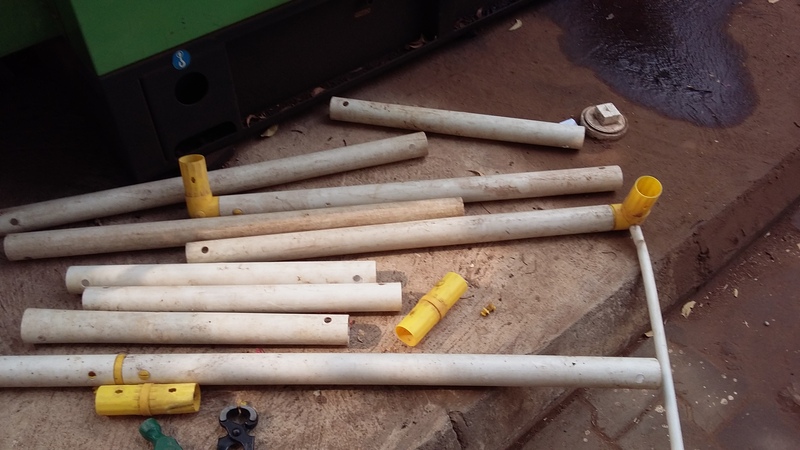 A plastic goal that was broken will become a batonka or boom-bams. Also I have been invited to play at two gigs this weekend by Jimmy, one of the school’s fantastic music teachers. So I feel that I have landed on my feet here and my Life has begun here in the fast lane. 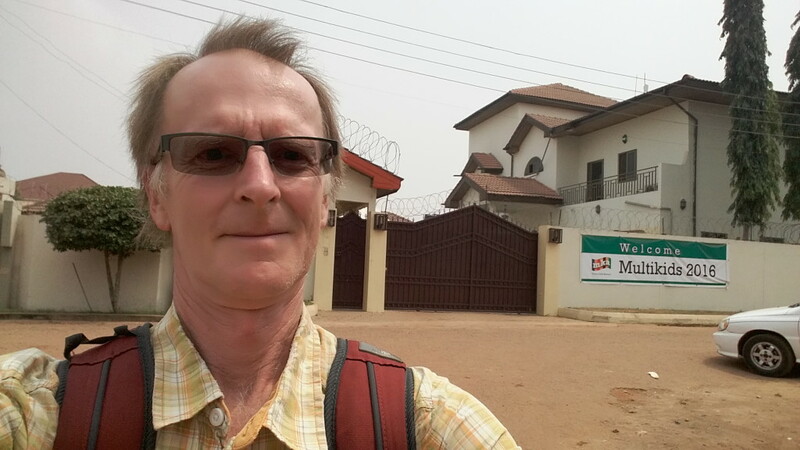 Amanda suggested that I work with 2 classes of pupils on the ASDAN programme. We now have timetabled regular sessions for me with these classes. We have cleared up a garage / storeroom for me to use as a workshop. 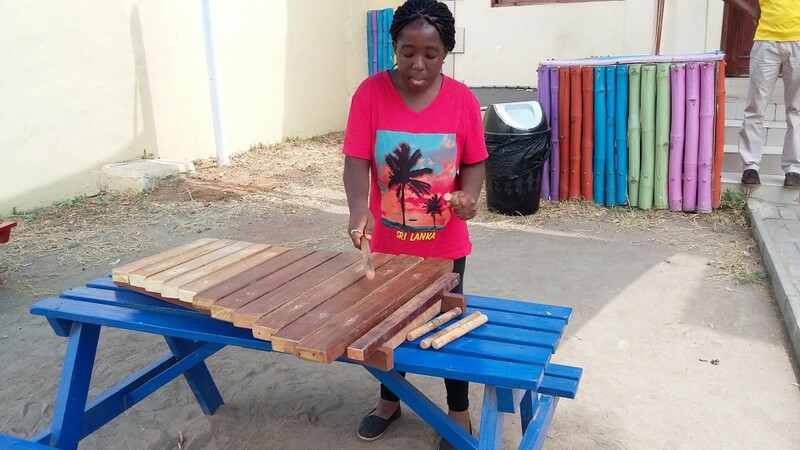 And on Monday 2nd February class SA4 started making a pentatonic xylophone from the broken table frame. SA3 started on a diatonic xylophone on Wednesday. 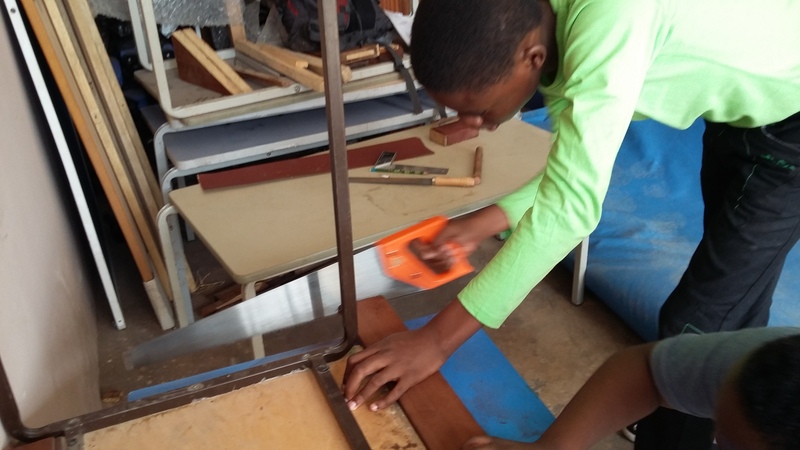 Some of these students have very little experience of using tools like a saw or a file, and expressed fear of using them. But with help were successful and keen to do more. On Thursday I was honoured to play with Nii Noi Nortey and Nii Otoo Annan at the Children’s school at Accra Psychiatric Hospital. We were joined by the Master puppeteer J C Abbey. The American film maker Steve Feld was there too with his friend and flautist Alex. I admire these musicians who have an ongoing commitment to these Thursday sessions. activities I found it hard to keep up with this blog! sorts of wonderful items from used plastic bags, mainly the small sacks of water that are sold on the street. They made hand bags, market bags, pencil cases, wallets and much more. 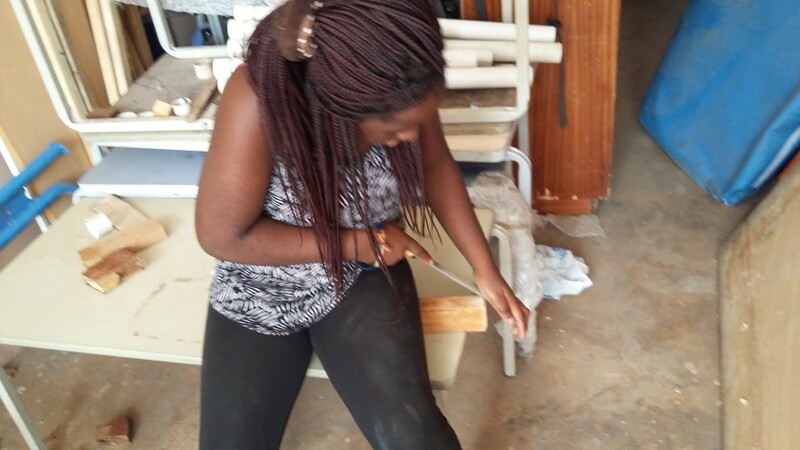 I also attended a First Aid training session for secondary students. This was a good reminder for me, and I was impressed with the interest that the secondary students displayed. 1 Taking turns copying rhythms . 3 Jamming – In which Player A holds a repeated figure. When this is well established player B joins in and can experiment and improvise. When player B joins finishes improvising they join in with the figure player A is playing. Then Player A can improvise. With all these games the number of players can be increased when the players are successful in pairs. Or an under-confident player can be twinned with a more confident player standing opposite to help hold a pattern. I encourage them to make eye contact while playing to help communication. Marking the key with a set square. I have nearly completed this Sound Table. Using blue painted parts from a broken school desk. 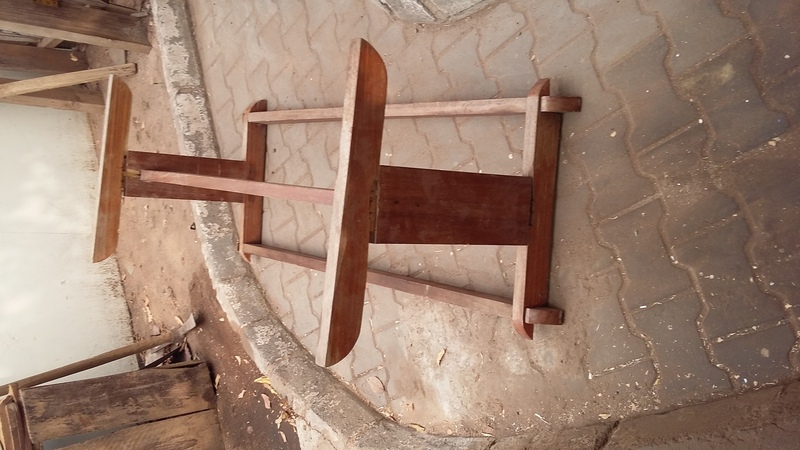 A book storage rack is amplified by the table when strummed by a beater, and the blue steel leg framework make lots of interesting high pitch sounds. Two long door springs add resonance or reverb to all the sounds and if scrapped make impressive noises. The nine nails of various lengths are another scrapper. Three bamboo keys are tuned to a minor chord and the bamboo tongues provide bass kalimba notes when plucked. Bamboo is plentiful here and I wish that I had spent more time exploring its musical properties in my time here. It is definitely an area of my practice I want to develop in the future. SA4 students playing the Sound Table with the pentatonic xylophone. 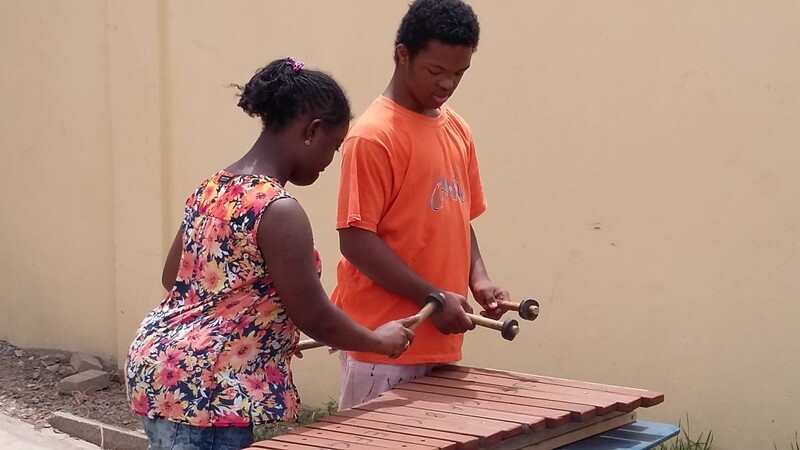 Pupils from SA4 play the pentatonic xylophone made from broken table frames. A teacher and student have a conversation on the diatonic xylophone that SA3 made. 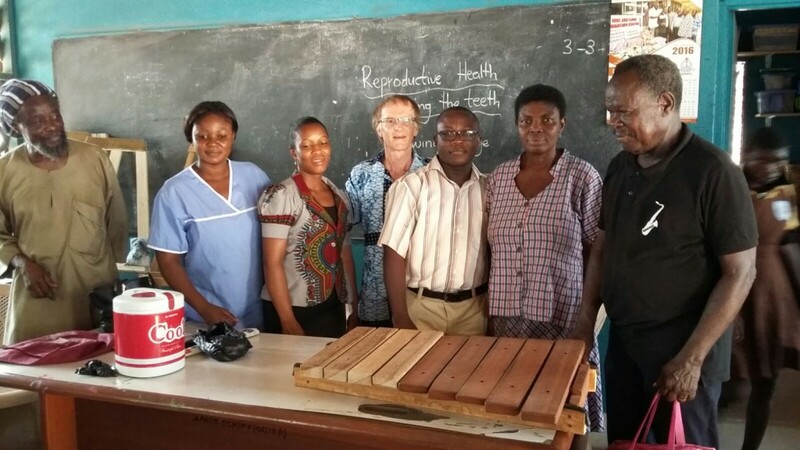 On my last Thursday visit to the school at the Psychiatric Hospital, Accra. 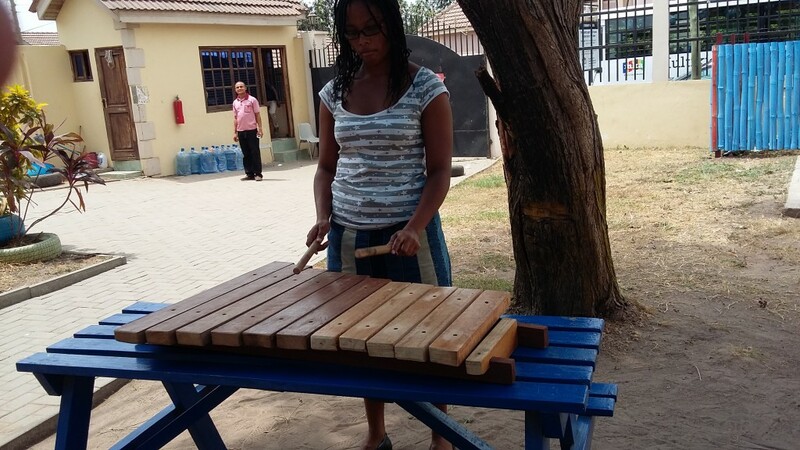 We donated a pentatonic xylophone. Some pupils were very engaged with it and took any opportunity to join in the music session on it. 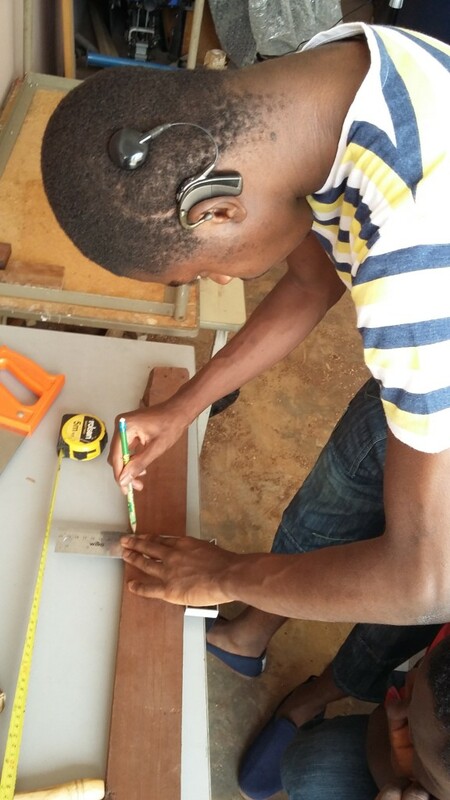 As much as I appreciate music I don’t know much about musical instruments so am not going to pretend I do… but for someone to turn broken table legs and pipes into musical instruments like Will did with my students here in Ghana, I think he deserves recommendation. Will guided a group of students here in Multikids Inclusive Academy to create musical instruments from broken stuffs. This is recycling and this is the kind of innovation we need to keep the world a better place not a garbage land.